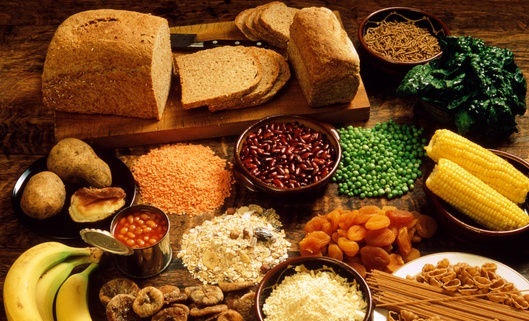 Dietary fibre is the indigestible part found in plant. Although dietary fibre is not absorbed by the human body, it still plays an important role in our health. Dietary fibre can be divided into soluble and insoluble form:Soluble fibre – is found mostly in bean products, oatmeal, and fruit. It combines with fat and passes through the body, and in that way helps to lower the body’s blood cholesterol levels, and keep blood sugar at a normal level.Insoluble fibre – comes mostly from wholegrain foods and vegetables. After absorbing water it expands and becomes soft, which aids the movement of the bowels and acts as an intestinal cleanser. The daily dietary fibre requirement for adults and teenagers should be not less than 25 grams. For young children, the daily requirement is equivalent to their age plus five. Eat at least 2 servings of fruit every day. Substitute dried bean products for meat 2-3 times a week. Replace part of your white rice with red or brown rice. Eat wholemeal bread and biscuits instead of breads and biscuits that have a high sugar and fat content. Pay attention to food labels, choose foods high in dietary fibre. Increase your dietary fibre intake gradually and have an adequate amount of fluids every day – at least 6-8 glasses.